The Mercedes AMG story from Palm Beach runs today. You should really pick up the paper, though. I got blasted across the whole cover of the second section, and I looooove this picture, the one they used on that cover. Their were a pair of those cranes hanging out at the track on the parking lot. They didn't care a bit that we were near them, but they were on the wrong side of the car to get pics. You had to shoot into the sun, which doesn't work and casts all kinds of bad shadow. I complained (nicely, of course, as I am wont to do) to the groundskeeper guy I'd been chatting with, and he instantly went to his truck and came back with some bread. He baited that crane all the way around the car, and I got this pic. He's the same guy that fed the alligator apple pie for me. I may take Louis the Groundskeeper with me everywhere I go, just to help me set up pics. Editor: "Lorraine, you have this crane picture tagged as a Mercedes-Benz C63 AMG. Its the Black Series C63, right?" 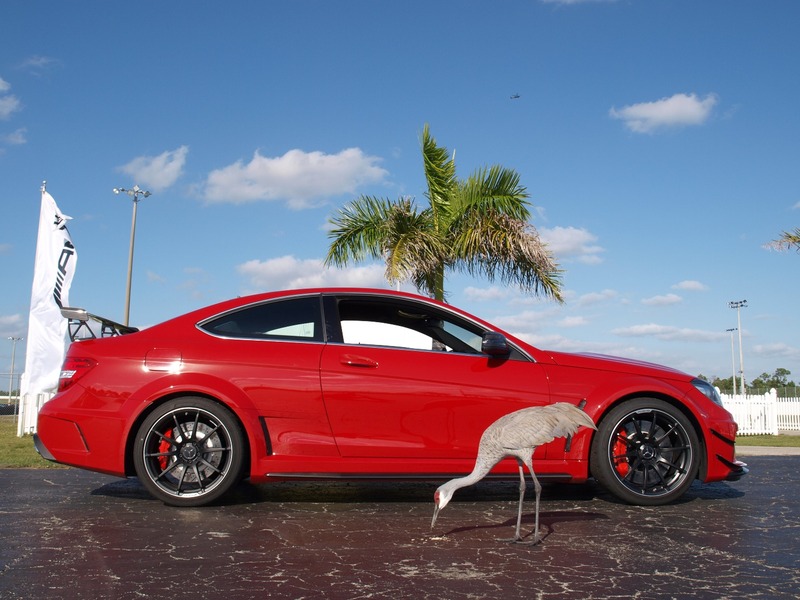 I represent the crane in the picture and have to advise you that a scattering of crumbs is below scale for appearing with a foreign car. At least a cherry danish is the required minimum - or in this case, perhaps apple strudel would be acceptable. My word is 'rator'; it does not state whether it s carbu or garbo. And didja notice the little red patch over the crane's eye that matches the red of the car perfectly? You planned that, didn't you?! I liked the picture very much. Sooo Miami Vice like. BTW I saw a pic of Don Johnson this summer and buy he didn't age well. His face resembled an irritated blowfish. That reminds me, anyone giving or getting blowfish pills for New Year's and if so, where are you getting them from? I can't find them anywheres...now what am I supposed to put in my friend's stocking? 1. I will tuck a cherry danish into my carry on for my next photo op. 3. That's actually a flamingo I doped and painted to match the car. 4. I am not touching blowfish pills. 5. Do not encourage him. I thought you said it was a stork. Just a minute. It's National Geographic on the phone offering me a job. The AMG flag in the background appears to be attached to the spoiler, making the whole contraption look like a convertible roof that someone tried to put up at 100 mph. Someone's got some splainin' to do!